As your car exits the freeway and turns onto the dirt roads leading to the Barossa, one of the first sights you will be greeted with is the door to Discovery Parks. The camping and caravan space has become an institution in the area, with kids and adults alike finding plenty of holiday fun among the picturesque escape. For those seeking something a little different however, the opening of their new eco-luxury accommodation is something you should pay attention to. 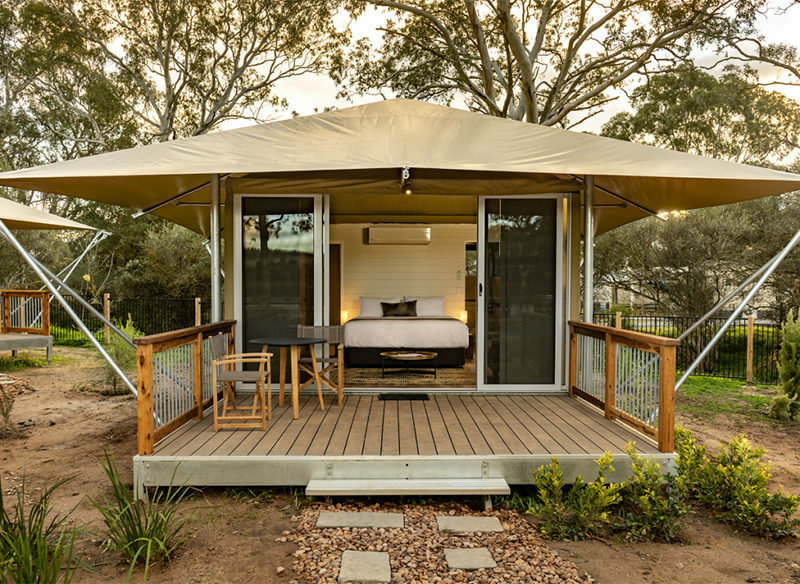 Nestled within a private area of the park, 12 safari tents have been pitched among native gums with vineyard views as far as the eye can see. With the tents sharing a private swimming pool with heated spa, and premium BBQ and lounge area, they are the ultimate place to unwind and embrace lavish comfort, while being close to nature. 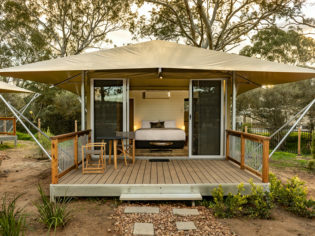 Complete attention has been paid to the design of the tents themselves, featuring a three metre deck, ensuite bathroom, kitchenette and spacious bedroom which can be configured to your liking. It’s a perfect compromise for those who love being amongst the action, but still far enough away to enjoy your own space. You can even book the entire 12-tent section of the park for special events; think hens weekends and special birthdays. Widely recognised as a world class destination for South Australian dining, Appellation at The Louise is every bit as decadent as you could imagine. Set among the rolling vineyards of the Barossa, Executive Chef Daniel Murphy writes the book on fine dining, creating a menu that creatively affirms an elegant sense of place. He proudly sources 85% of ingredients from South Australia, finding menu inspiration from what is fresh from the kitchen garden, as well as nearby local growers and farmers. Choose a plate that tickles your fancy from the ‘Selections’ menu, or sit back, relax and let them do all the hard work with a 4 course ‘Set’ menu option. For wine, Sommelier Patrick Burgun will be pleased to make pairing suggestions, otherwise pick a bottle from our cellar. In the world of food, Maggie Beer is a name worth knowing. But as it turns out, the culinary talent is genetic. Daughter Elli Beer has really come into her own with the opening of The Farm Eatery and Experience Centre, and let me tell you, it is every bit as impressive as her mother’s legacy. Part modern, casual eatery, part experience centre, the industrial space serves as an all-day activity for those who find themselves with a couple of hours to spare in the Barossa. Helmed by renowned chef Tim Bourke, formerly of Kangaroo Island’s Southern Ocean Lodge, the restaurant showcases the freshest ingredients in a low-key, non-pretentious environment just begging to be enjoyed. If you’re keen to make a day of it, the experience centre will host a selection Gastronomic events. I was lucky enough to stumble upon a class at Barossa Valley’s first Gin School, taught by resident artisan distiller (and Eli Beer’s husband) Brett Durand of Durand Distillery. You’ll find some of the best local produce going at the Barossa Farmers’ Market. Grab a coffee from Barossa Coffee Roasters, take a slow stroll around and enjoy a chat with the locals. Whether it’s a bowl of pasta, a cooking class with chef Matteo or just a coffee, Casa Carboni is at the top of my list. One of the greatest places to soak up the sunset with a glass of the Valley’s finest in hand. For a winning combination make sure you try Harvest Kitchen’s fried chicken with a glass of Hobbs ‘With Freckles’ Viognier – I’m addicted! This art gallery is seriously impressive and one of my favourite places to explore. The Jam Factory’s exhibitions are world-class and you can also mingle with the artists-in-residence who open up their onsite studios to the public. Trying on all of milliner Julie Fleming’s hats is a personal favourite pastime. One of my favourite cellar doors in the Barossa; cosy in winter with beautiful surrounds to enjoy in summer, it’s perfect every time you visit. And, most importantly, the wines at Yelland & Papps are exceptional.